Robots are ever closer to being clever enough, autonomous enough, and useful enough to actually become part of daily life. Here are the latest robo-developments. The Tokyo Institute of Technology’s Hasegawa Group has built self-organizing neural networks into the brain of a semi-humanoid android and, as a result, have given it powers that seem like science fiction. It can learn pretty much the same way we do, it learns from its mistakes too, and as it does its tasks it constantly adjusts and corrects itself until it can perfect its moves. The idea is that this kind of plasticity, the ability to deviate from a strictly programmed set of behaviors and still achieve a task, will be incredibly useful for the future of assembly-line robots–which are stuck right now if anything even slightly different happens to it while working. Qbo is a useful research robot. A team at TheCorpora has proven exactly how useful it is by teaching a Qbo to recognize hand signals, imaged by its stereoscopic cameras. In its simplest implementation they’ve used it to build a mobile stereo system into Qbo. It’s not just for fun–there are many situations when controlling a robot by voice commands (a natural human way to interact with a device like this) isn’t possible, or is computationally difficult, such as in a highly noisy environment. We can also imagine a couple of dozen military uses for this tech. 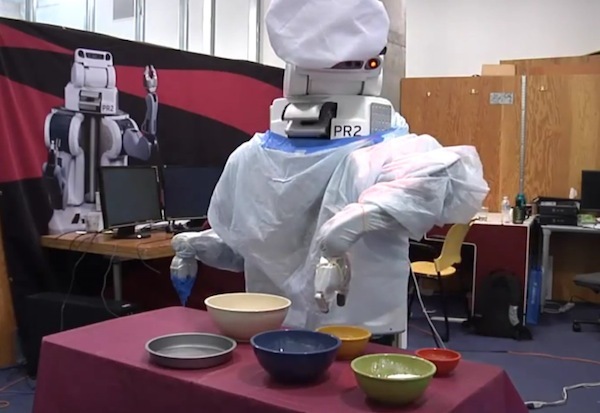 That other famous research robot, PR2, was previously programmed to help in a cooking experiment. Now, suitably protected like any young learning child with a splatter-proof outfit, PR2 has been taught to bake a cookie completely from scratch. Impressive? You bet. A hint at the future of butler bots and robot chefs? Totally. Paro, the robotic seal designed to soothe patients in medical establishments and provide a degree of social comfort to people in otherwise difficult circumstances (such as elderly folks in assisted living facilities) has found itself a very high-profile job indeed. In the disastrous aftermath of the Japanese earthquake and tsunami, Paro’s helping residents in a retirement home near the wrecked and radiation-leaking nuclear reactors at Fukushima. Two Paros have been lent, and according to anecdotal evidence from the retirees themselves, they really do “work,” being something akin to a pet. Heart-warming as this is, the notion may disturb some of us whose lives aren’t quite so influenced by robots–suggesting a future where a genuinely soul-less machine has an important social role, perhaps as a nurse in a hospital (not this one). The thing to remember is that these elderly Japanese are feeling better because of the Paro bots, and if the bots weren’t there they wouldn’t have been able to deal with the emotional scars.